In five years, St Ninian’s Cathedral will reach the venerable age of 150 years old. In that time, the cathedral has seen many changes; renovations, restorations, and additions. For that 150th anniversary, retired StFX computer science professor, Ernst Schuegraf, is hoping that the most recent restoration will be finished in time. Schuegraf is a passionate advocate for the return of the work of the original artist, Ozias Leduc, a lauded Québecois artist, whose work in St Ninian’s has been altered, covered over, and almost forgotten even in the time before his death 1955. Schuegraf has been deeply involved in the research, restoration advocacy, and funding drives in hopes that the public will be able to see the illustrious artwork of Leduc in time for the anniversary. 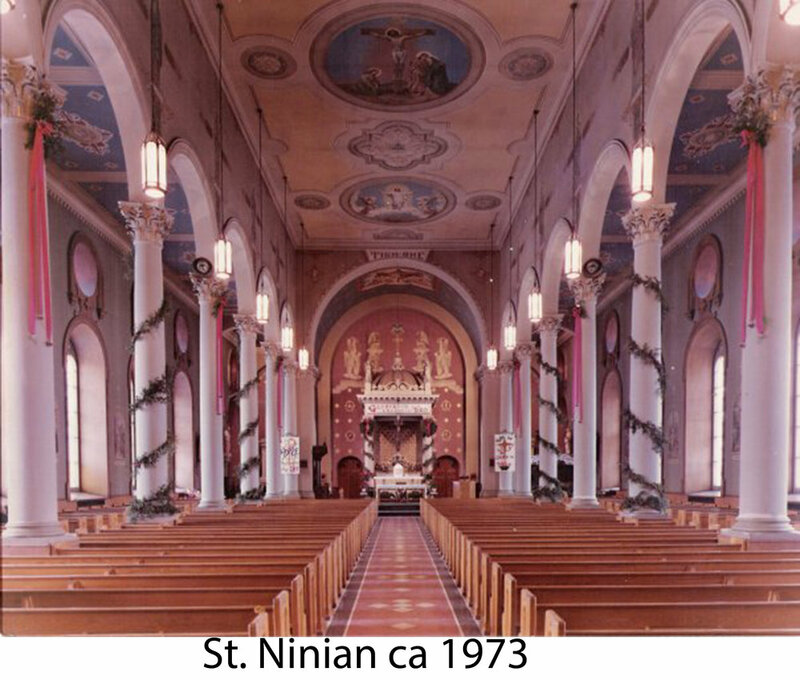 Though lauded and celebrated in Québec, where his skill can still be seen in a number of Catholic churches across the province, Leduc’s work at St Ninian’s is only now being restored to some of its former glory. When originally completed, the cathedral had a rear, semi-circular space with a large stain glass window, the apse, which poured light into the length of the cathedral. Leduc utilised this central source of light and painted the twelve apostles (plus St. John the Baptist and St. Cecilia) down the length of the main space, the nave, ensconcing them in painted faux-stonework niches, and painted shadows and highlights into the faux stone niches as if light from the apse was pouring in at early morning. Originally, each of the niches were connected to each other with elaborate lines of faux stonework painting, but this was all painted over and forgotten sometime after the 1930s. The cathedral is the result of a move of the diocese from Arichat to Antigonish. Built to improve a smaller church on main street, of which only the cemetery still remains, which can be found behind the gas station and the Royal Canadian Legion building. The men of the time were expected by the bishop to provide one day of unpaid labour a week to help build, move, and quarry limestone and sandstone from North Grant. The unpaid labour was in addition to the charge of 89¢ a head, no small fee in the 1860s, levied on the parishioners to help pay for the cathedral. The cathedral still retains some of the hidden mementoes of Antigonish’s important maritime past; the church rests on timbers salvaged from a shipwreck at the time of construction, and the glass prisms that directed light into the lower decks of the ship are still in place directing sunlight into crawlspaces below the cathedral. Even with some attempts to control costs the diocese was left in debt to the tune of $40 000 (more than a million dollars in 2019), including the efforts made to move the fledgling university to Antigonish from Cape Breton. The cathedral also boasts the original organ that was installed during its construction, a manual organ than Father Donald MacGillivray says is of such quality that “it will last another 500 years.” Once St. Ninian’s was completed it was the largest stone building east of Montréal for some time and a good example of Romanesque architecture, which was rather in vogue across North America and Western Europe. Finished and consecrated in 1874, it would be almost 30 years before the interior would be Leduc would be hired to paint the nave, the ceiling, and the stations of the cross. Although some of his artwork would have been painted in Montréal on canvas and transported to Antigonish (to be glued into placed in a process called merouflage), while in town, Leduc painted a number of landscapes and portraits, some of which can still be seen around the university. However, much of his artwork has been painted over, destroyed or, like his works in Xavier Hall, lost during renovations in the 1930s and 1950s, the niches and the apostles were completely painted over, only now to be painstakingly restored. 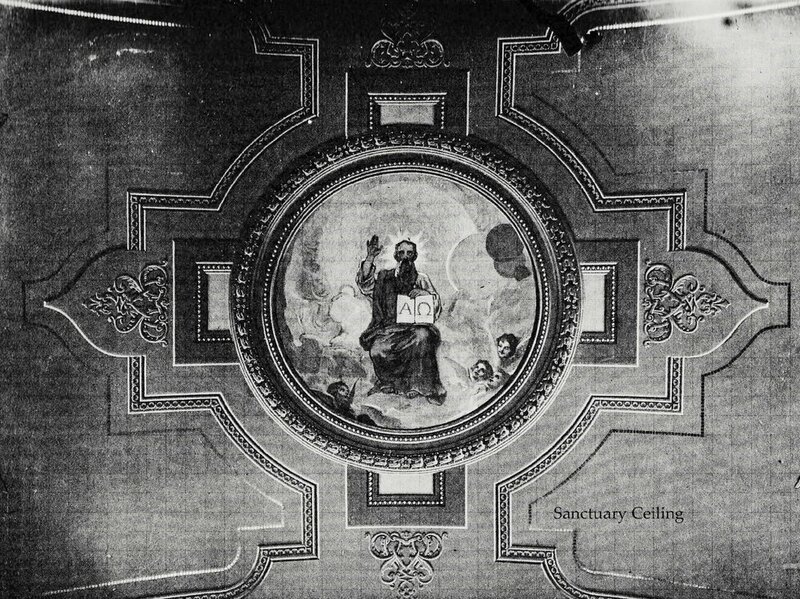 A large painting over the altar of God carrying a book inscribed with the alpha and omega symbols, has been so badly painted over that only the beard remains and the cost to restore the rest is staggering, and no less made worse by steam leaks, moisture, and soot damage from decades past. The work of raising money to restore the cathedral is considerable. The annual repairs to the church and a 2012 settlement to victims of former Nova Scotia priest, Hugh Vincent MacDonald, have left the Diocese with few available resources to restore the saints, each with a $20 000 price tag. It has only been through the generosity of the parishioners of St. Ninian’s that Father Donald MacGillivray and Ersnt Schuegraf have been able to restore five of the fourteen saints to the original glory of Ozias Leduc. 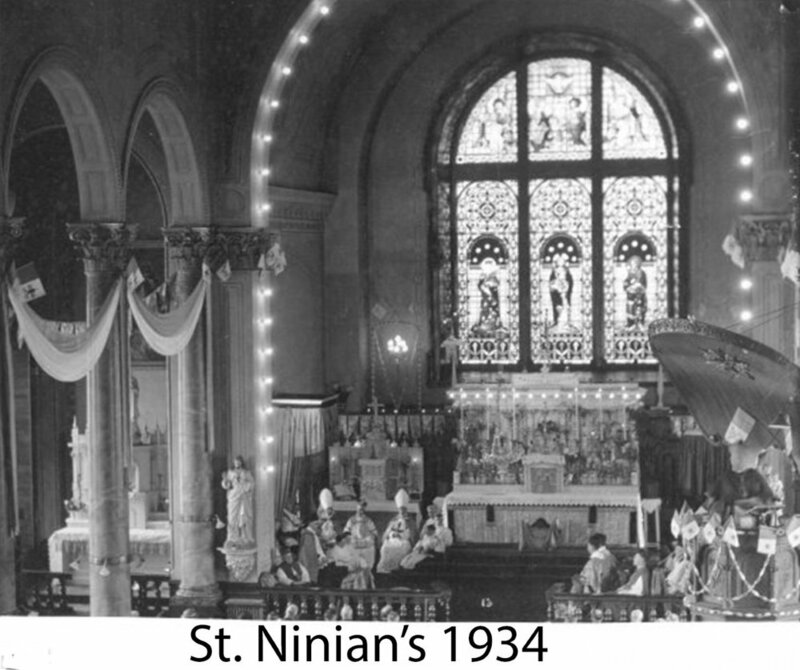 Anyone interested in learning about St. Ninian’s cathedral or donating to restoration efforts can visit saintninian.ca.